I have a limited edition star wars pack. can you put custom firmware on it? yes you can but it depends on when you purchased it, if it was in 2008 than for sure you can, if it was this year than you will have to check some of the other identifier methods (I have one myself thats how I know, got it Dec 08). i have a piano black limitedediton psp..I got it last year in october. (2008) I want 2 hack it but reading ur stuff ...imscaredbcuzmy psp camewith v 4.01 and has serialnumber HU2...and so on...so is itpossibleformeto hack it? The information seems to be helpful but I still have a question. I have a psp Piano Black and the only way I can check it is step two. 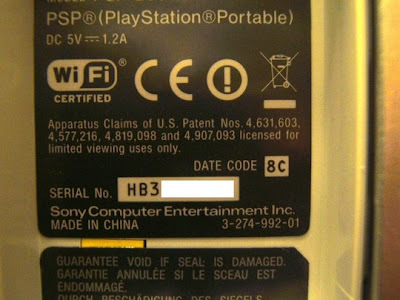 What does it mean if the psp serial number I see that is similar to the picture? What if mine starts with HU0? Is it hackable? With what level of certainty? Any answers would be greatly appreciated. sir my psp was bought by my uncle in dubai, but i can't really trace what is its motherboard. could you help me try to figure it out by not depending on the labels outside? because i think my psp2000 has a different casing than what's in its internal hardware.tnx i need help pls. sir i think my motherboard is ta-088 v.3 and im using a chickhen w/ a firmware of 5.03 MHU but still i cant play other games, what happen is while playing sometimes my psp suddenly shuts off and my chickHen was disable what do you think is the cause of this incident? kindly email me at robbie_vargas69@yahoo.com tnx! what if the serial number of my psp is HE0??? I have a limited edition daxter psp I CAN HAVE CUSTOM FIRMWARE !!!!!!!!!! my psp 2000 had a problem eith the motherboard after i upgrade the version.. now i want to replace the motherboar... can i use a motherboard PSP 1000 to replace with my PSP 2000??? my serial is HU02 will it work? I have a PSP 3006 with a serial number beginning with "HE"
Update icon under Game Category saying "PSP Update ver 3.71"
Is there any way i can downgrade it so i can play games from the memory stick and also what steps should i take to do so? I have a psp 3000 series, its version is 6.20 , and i got it cracked but i ain't sure, i don't know whether it is cracked or not. and now i don't have the extras icon.so i am doubtful. hi i got a piano black slim psp 2000 and i was wandering if the serial numberhuo277152 hackable? Hello, i bought psp a year ago, the limited edition slim madden package. My questions: Is my psp hackable i dont know the OFW, cause it has 4.01 m33-2 installed on it ? is 4.01 m33-2 a CFW? and if it is does it mean that my psp is hackable. Thank you so much for these valuable information. It is really helpful. I still have one more question to ask if possible. I have a PSP 2000 that has a serial number starting with HB080... ,but the box contains the letter G, and I don't remember what was the first official firmware it came with. 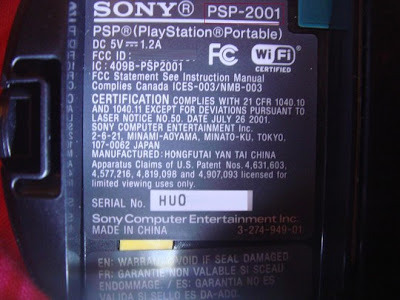 My question is: Should my PSP meet all the conditions listed above to be hackable, or can I say it is hackable since the serial number starts with HB080??? 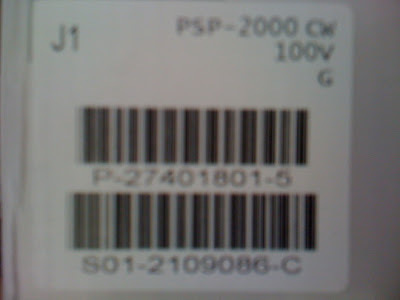 I have a 2000PSP serial no:HC3309856, Date code: 8C. 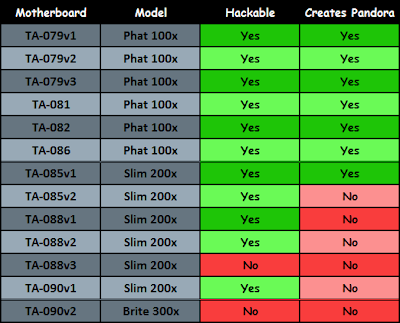 is it fully hackable? i have a psp 3001c that came without a box since i had to have it fixed. it has an HU0 serial number. can it be custom firmwared? I have a psp slim ofw 4.01.can i put games in without the cfw? my psp # wasnt in your list. serial # starting HU738. so ? i have a psp 3001 and i broke the screen and i bought a 3000 screen but it was too big. Hi.. I have a PSP 3006 with a serial number beginning with "HE"
I have psp 3003 and recently downgraded it from 6.35 to 6.20. How do I know what g it is so i can put pro cfw on it?